Some of you already know SK NEO. If not in person at least from his cool fan art and his Twitter posts where that pink Gundam figure can be seen in various locations. It’s about time to let man himself tell us about his life as a Hello! 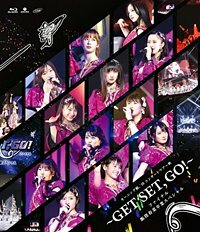 Project & Momoko Tsugunaga wota. How would you like to introduce yourself? I’m just a common Hello! Project fan. As we say “Haro-Wota”. 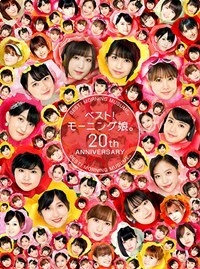 I love Momochi, Berryz Kobo and Country Girls. I am almost always in venues of Country Girls & Momochi. I’m one of those “OMA-ITSU’s”. “OMA-ITSU” is a term of wota shortened from “OMAe ITSUmo Iruna”. In English it means “You are always here”. I like drawing pictures and post fan arts on Twitter under my pen name SK NEO, which is abbreviation from “Salaryman Kobo Neo”. I like to build models too. 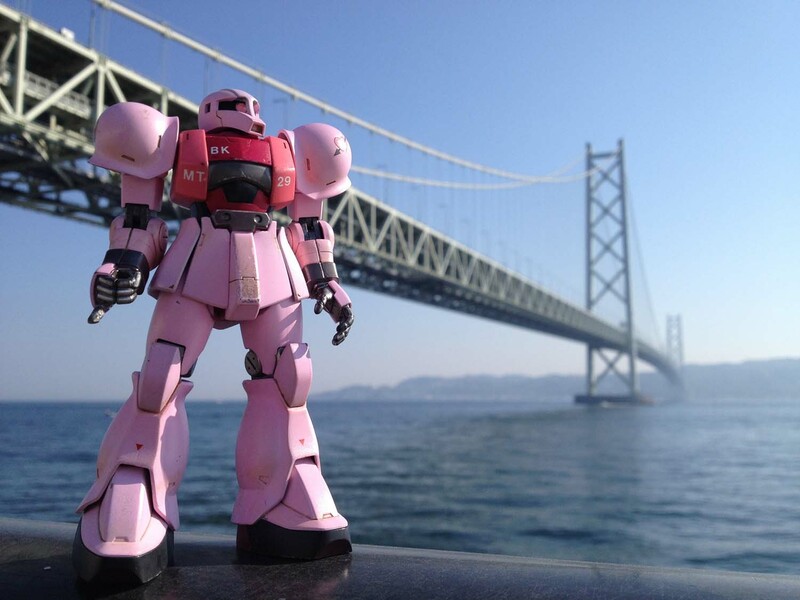 I carry aroud a plastic model of Zaku painted pink which is Momochi’s character color. 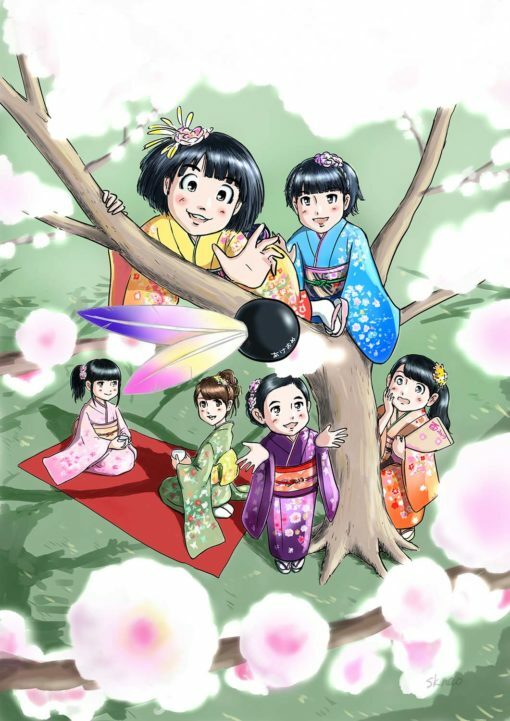 You are quite well-known among Berryz Kobo and Country Girls supporters as a fan artist. Tell us how & why you become a fan artist? I became a H!P fan around 2001. That was so-called The Golden Age of H!P. At first I was a fan of Morning Musume and especially Asami Konno a.ka. Konkon. In 2006, after her graduation, I came to attend the events of Berryz Kobo and went crazy about Momochi. 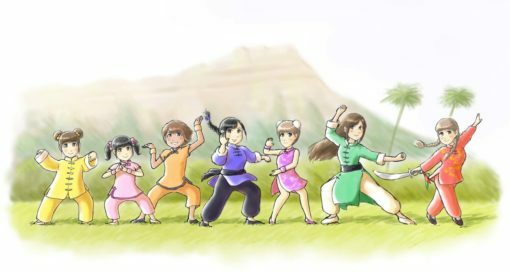 I started to draw fan art in spring 2009. As a matter of fact during these eight years after 2001 I had never painted any pictures of H!P. The direct trigger of starting to draw was the letter box in the concert hall of Berryz Kobo spring concert 2009 “Sono-subete-no-Ai-ni” (For All Loves). At this concert tour seven mail boxes for each Berryz members were set up in the halls. I saw those and decided to mail to Momochi in each concert. But I didn’t always knew what to write. That’s why I thought I could draw a picture postcard instead. That’s how it all started. After that I have made a picture postcard in each concert and started to post those pictures on Twitter from 2010. Recently I’ve been busy with my daytime job and have not always had time to draw those postcards. In 2009 they started illustration contests in H!P Official shop so I’ve attended to the contests every year. In the second year I received an award. As a prize I got a Polaroid photo with Momochi’s message. Sure I was very happy! Your most beloved character is without doubt Momochi. 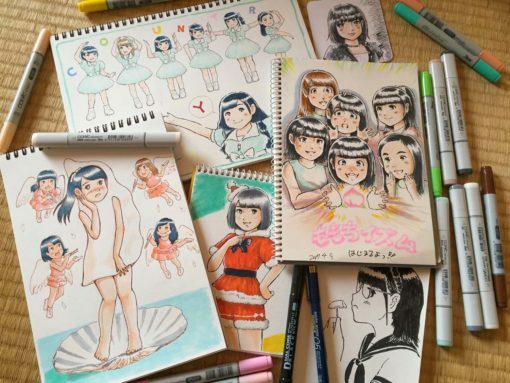 How you found the right style for drawing Momochi (and other Berryz members)? Was it hard to find out the right way to draw Momochi character? 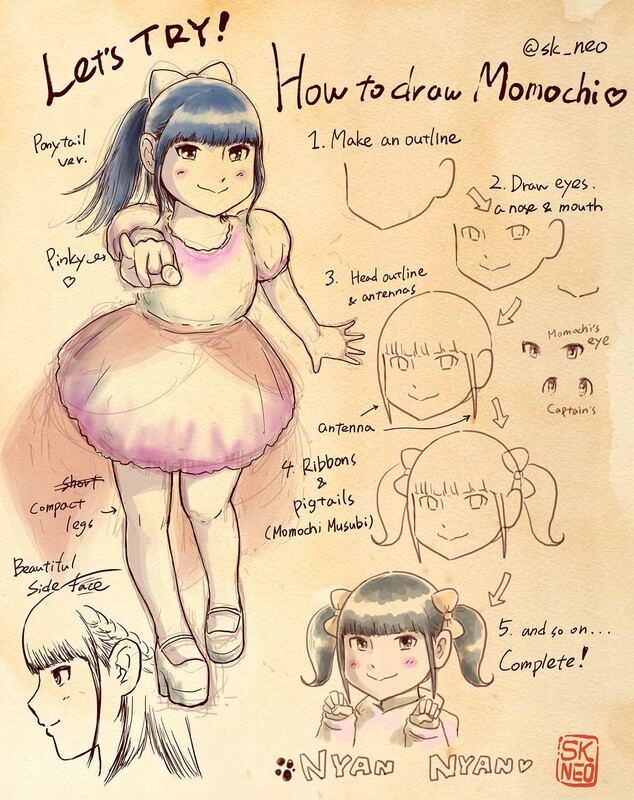 What are the main characteristics on Momochi? It took time and drawing over and over again. Finally I found how to draw Momochi and other members. But in the beginning I watched closely at other good fan artists and how they captured personal features. There are many fan artists of H!P who have done awesome pictures for a long time. Your works has been released in various self-published books and fanzines. Tell us about those publications. Since 2013 I have published H!P fanzines and run a booth at Comic Market every summer and winter. The idea for starting to publish fanzines was the encounter with the people of Illust-Morning thread in 2channel BB. 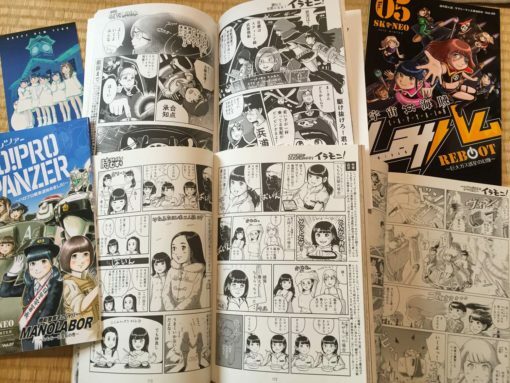 Various creative and crazy people are gathering on Illust-Morning thread and they have published H!P anthology fanzines for a long time. I’ve participated in their group from volume No.10. Anthology’s chief editor Rikaya told me how to publish a fanzine and how to draw cartoons and he also encouraged me to publish my personal fanzines. Now I’ve been busy drawing manuscripts before deadlines every summer and winter. 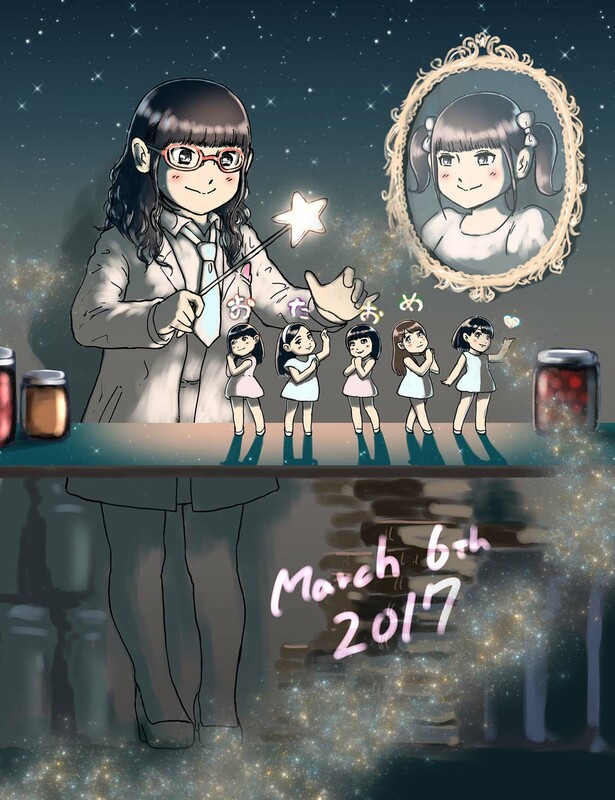 I draw parody cartoons of H!P. My first comics was “Space Pirates Captain Shimi-Hamu”. Other works are a STAR WARS’s parody featuring Uta-chan and a time-travel story featuring Musubu Funaki. I’ve made lot of this kind of stuff. There are fan art comics but also some adult oriented stuff. Yes some fanzines have kind of sensitive content. Sometimes there is a bit naughty stuff in them but out group keeps those fanzines out from normal fan circuit. How you advertise and sell your publications? I just draw pictures. I hardly advertise my publications, only tweeting about them. I sell them only in Comic Market twice an year. I’m just too busy with my daytime job to do any extra work to promote my works. Has any major Japanese media (magazines, wed sites etc.) published your works? No. But when I applied for the illustration contest of H!P Official shop I was mentioned on Hello Channel DVD. On that DVD Maasa Sudo is looking at my drawing and says that she would like to read a comic which was drawn by me. I was of course happy to hear that. Those Maasa’s words were one of the trigger for me to start drawing cartoons. As an artist are you self-educated? Yes I’m self-educated. I often draw pictures referring to my favorite fan artists and read how-to manuals. My cartoon drawing mentor is Rikaya. What kind of techniques and tools you use when making fan art? 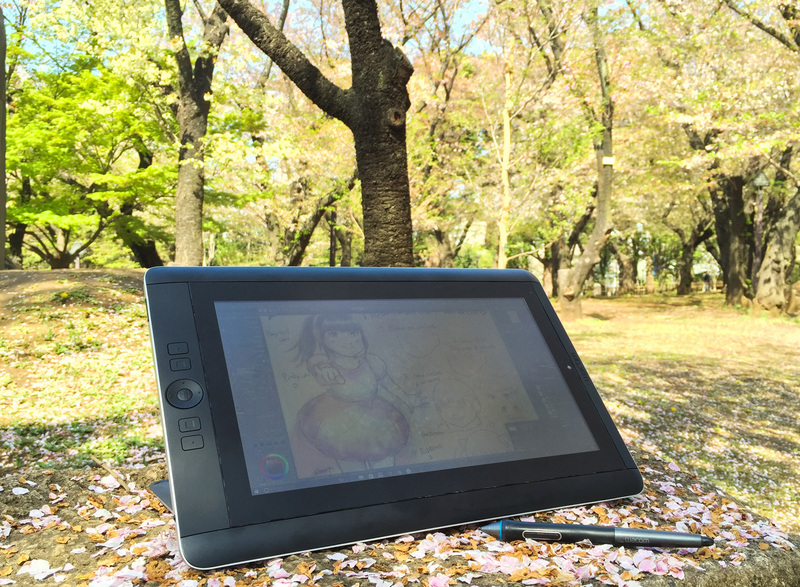 I use mainly Wacom’s LCD mobile tablet “Cintiq Companion” when doing digital pictures. This is not only a tablet but also a laptop so I can draw fan arts and cartoons everywhere I happen to be. When I draw in traditional way I use Copic pens. I usually carry a sketchbook and pens with me when I go to the events. Besides making fan art do you do also painting or other visual art forms? At the moment I make only fan art. Besides painting I have also made 3D figures of Berryz members. In the future I woud like to draw cartoon based on original story. Would you like to tell us what’s your daytime job? I mean you can’t get you living with doing fan art. I am working in the accounting department of an IT company in Tokyo. Like in many other Japanese companies my working days are long. But hard working means decent salary that’s why I can go to so many events of Country Girls. I think it would be nice if I could make may living with doing fan arts but in Japan that’s a very difficult thing to do. What is so special about Momochi as a person? Why you love her so much? Momochi is a pretty girl, a sweet singer, a bright playing manager and a perfect idol. But those thing are actually quite irrelevant for me. The main reason to love Momochi is that she is here, that she exists. That fact gives me power to live. When I am about to fall into dark side, just thinking about her makes me happy. Do Momochi know you and your fan art? I think she probably knows what I’m drawing since I got that Polaroid with her as I told earlier. But I have never asked directly from her any questions about my fan arts. How you reacted when you first time heard that Momochi is graduating and leaving the idol world? I participated that concert in which Momochi’s graduation was announced but it took a while for me to understand the thing. When I finally understood the fact I could’t stand up on my own. For a while I didn’t have any appetite at all and I lost weight. 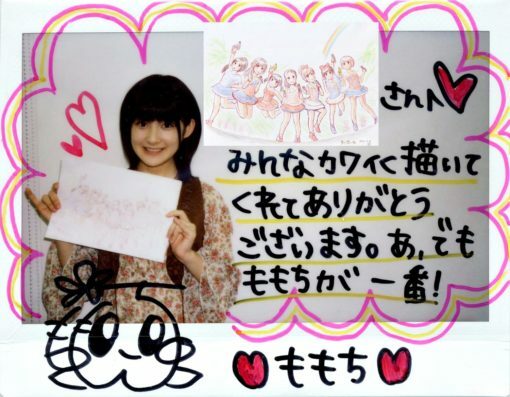 Have you any plans to give Momochi a gift or something when she is graduating? I do not think anything special. I will keep doing what I have been doing. When Momochi is finally graduated what is left for you in Hello! Project? You still continue following Country Girls? What about other groups such as Kobushi Factory, Tsubaki Factory etc.? I don’t know. I may continue following Country Girls . . or may stop following. Of course I like those remaining members of Country Girls. Especially May Ozeki and Musubu Funaki. I also like Hama-chan in Kobushi Factory and I’ve recently been a little bit intereted in Mizuho Ono from Tsubaki Factory. But I really do not know what I will actually do when the time comes. What have been the greatest moments Berryz Kobo gave to you? Berryz Kobo has always given to me the greatest moments. I can’t select the best one. All in all the first days when Berryz Kobo concert tours started in every year were the greatest moments. On those days I used to walk to the concert halls from the nearest stations with my heart beating fast and thinking that I would see Berryz Kobo soon and wondering what songs they would sing. Finally the curtain raised and the time of delight had come! I think I can say that days on which Berryz concert tours were held were those precious ones. 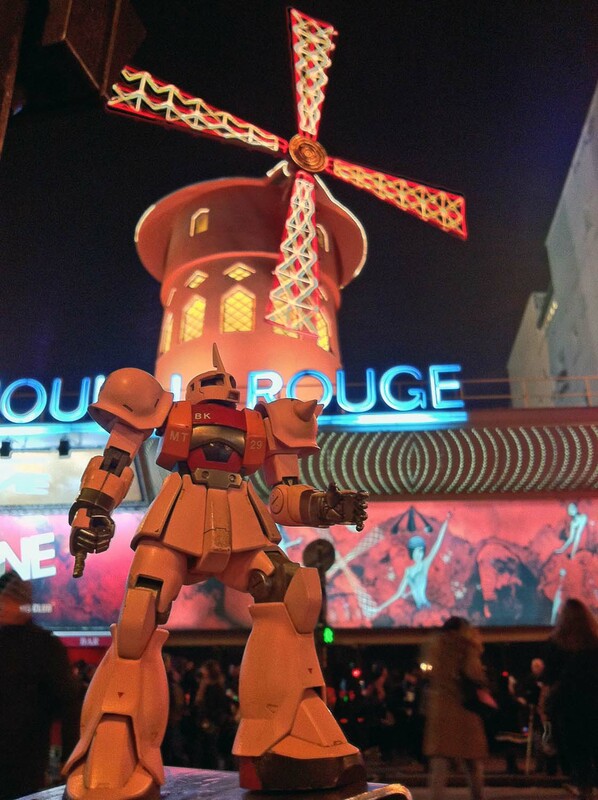 What is the story behaind those Gundam figures we have seen so many times in the photos you have tweeted? It’s the plastic model of Zaku (old type) which appears in the Japanese famous animation “Mobile suit Gundam” commonly known as “Gun-Pla”. It’s not a leading character but has a enemy role, I like the round shape of Zaku. This was originally green and I painted it pink as it is Momochi’s image color. There is a culture in Japan that fans of idols enjoy remodeling Gun-Pla. Those Gun-Pla’s pimped by idols are called Wota-Zaku’s. In 2010, when Berryz Kobo did their Hawaii tour, I made seven remodeled Gun-Pla’s. Among them was this pink Zaku. I have been with it to Hawaii, Rome, Seattle, Paris, Bangkok and Taipei. 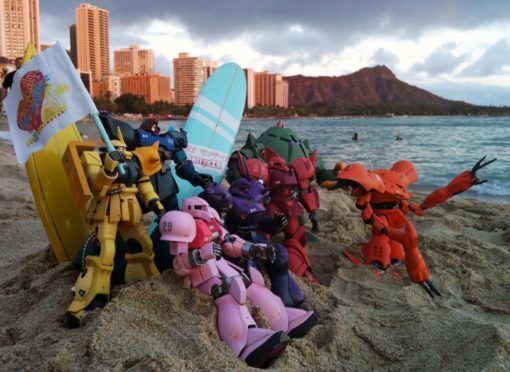 Maybe this pink one is the Gun-Pla that has traveled the longest distance in the world. Is there anyting outside Hello! Project? You are (and have been) a very active H!P wota. Do you happen to remember how many times you for example saw Berryz Kobo in concerts and other live events plus bus tours? To be honest I can’t say how many times I saw Berryz Kobo. I counted all my BK tickets one year before Berryz Kobo was disbanded and there were about 80 tickets. Those were not all tickets I’ve had so maybe I saw them more than 80 times. Of course it’s many times but there are lot of fans who go to H!P events even more often than I. Are you still as active wota as when Berryz Kobo was still going strong & was active? Now I am more active than I used to be on Berryz era. I want to go to every possible event of Country Girls, I want to draw more fan art and want to write more comics. Only the time is the limit. Have you followed any artists and/or groups outside H!P? 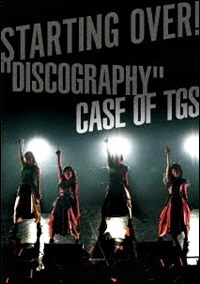 I bought CDs of other artists before discovering H!P. First concert I went was Hello! Project’s. Today I have no time to follow any other artists. I’m satisfied with H!P only and following Momochi and Country Girls is the best I can do. Is there any western music you like and are listening to? I know that you have seen at least Berryz Kobo and Bouno! in Paris. Am I right? What kind o trips you have done to overseas? Tell us about your Paris visits? Have you been to USA? Yes I have been to Buono! 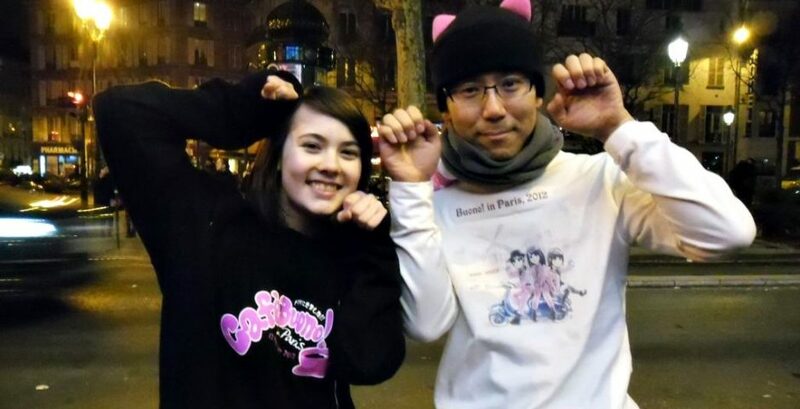 concert in Paris 2012 but I didn’t go to Japan Expo 2014 in Paris when Berryz & °C-ute were invited because I could not take off from my work. I have been also to USA. When I was in Paris in 2012 I stayed there only two days due to work circumstances. But I fully enjoyed Paris. Although it was chilly winter weather and minus 5 degrees or less even during daytime, I roamed around Paris, looked around various place like Basilique du Sacré-Cœur de Montmartre, La tour Eiffel, Musee du Louvre, Cathédrale Notre-Dame and so on. My friend had his wallet stolen on subway but it is a funny story nowadays. And above all enthusiasm of European fans struck me! They lined up before a live house in severe cold from the beginning of morning hours. I was really surprised at their excitement. Needless to say Buono! concert really became lively! When the concert was over and I came outside the hall it had began to snow. I will never forget that scenery. How would you describe differences between Japanese and western Hello! Project fans? I have talked with H!P fans all over the world. I think the only difference is the place where everyone is living. All of them love H!P in the same way. Even though they live in the faraway places from Japan and only limited information is available, the quantity of their enthusiasm is not different compared to a Japanese fan. I am really grateful that I’ve met some of you western fans. 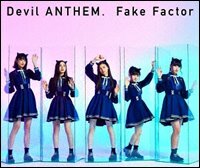 What are your “All time top ten H!P songs”? Very difficult to answer this. There are over 100 songs from Berryz Kobo only. I like Country Girls’ and Country Musume’s songs too. 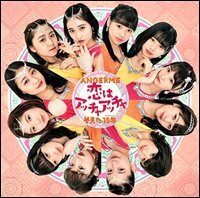 Of course Morning Musume, S/mileage, ANGERME, Juice=Juice and other group’s have also done lot of my favorite songs. So this is my current ranking. It will change from moment to moment. VIVA barairo no jinsei / Country Girls?Not released? Credits: First photo (Angélique & SK NEO) is from Angélique’s archive. All other pictures are from SK NEO.